How do you feel about coleslaw? Personally, I’ve never really been huge a fan. And that’s not because I don’t like mayo. I used to have a pretty weird appreciation for all things mayonnaise as a kid. My family still love to remind me about it. To be fair to coleslaw, it’s been a while since I last tried a traditional coleslaw. I used to be such a picky eater and coleslaw has got a lot of weird, unidentifiable things going on for a small kid, ya know? But this stuff – I can get behind this Thai Peanut Coleslaw. Crunchy, thinly sliced veggies swimming in a salty, savoury peanut sauce. If you’re looking for a paleo option simply swap out the peanut butter for almond butter. You can use either coconut aminos (soy free) or tamari/soy sauce in the recipe. Keep in mind that tamari and soy are much saltier than coconut aminos so you’ll need to adjust the amounts you use – more on that in the recipe notes. 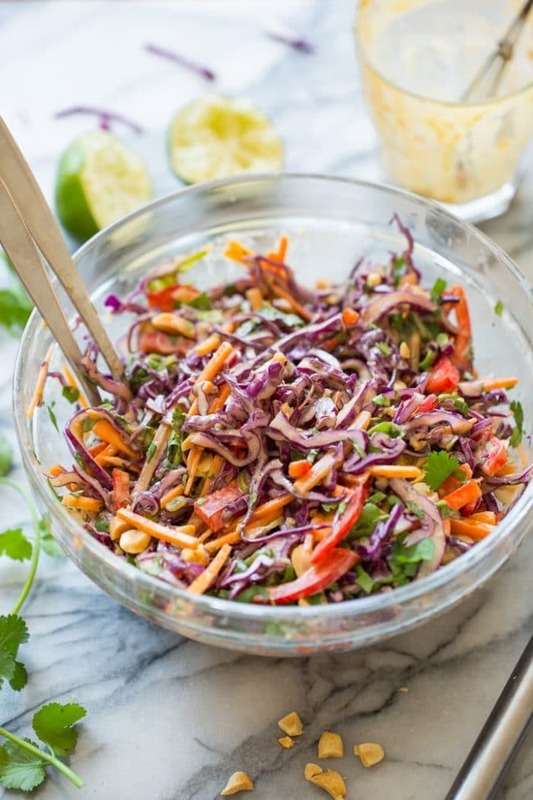 As for the salad base we’re looking at the usual suspects of cabbage, carrot, and spring onion with the addition of red bell pepper, cilantro, and peanuts for a more Thai-inspired flair. It’s loaded up with tons of texture and crunch that really shine in a creamy peanut sauce. Altogether this peanut coleslaw can be prepped in about 20 minutes – even less time if you use a food processor to shred and slice your veg. 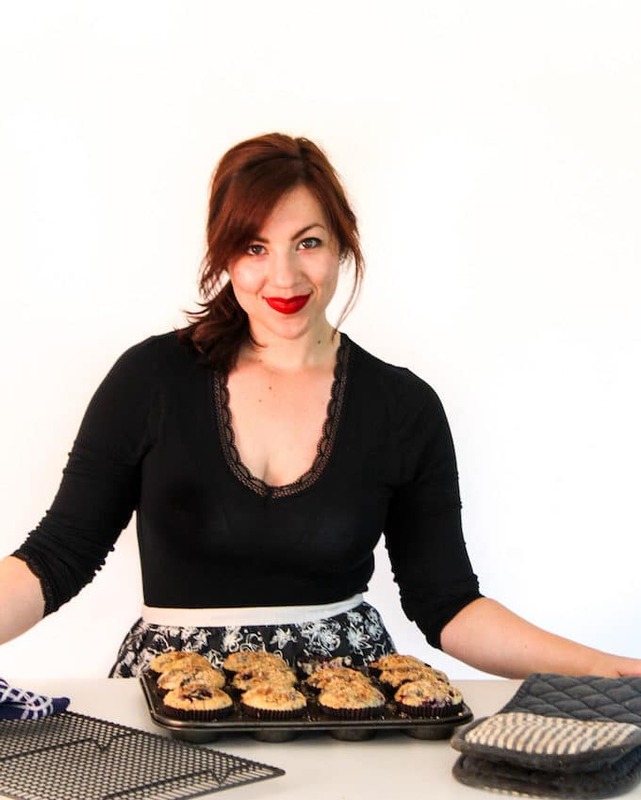 Enjoy as a simple dinner side or serve up at your next BBQ or potluck! This dish is a complete powerhouse packed full of nutrient dense veggies to keep you full and well! 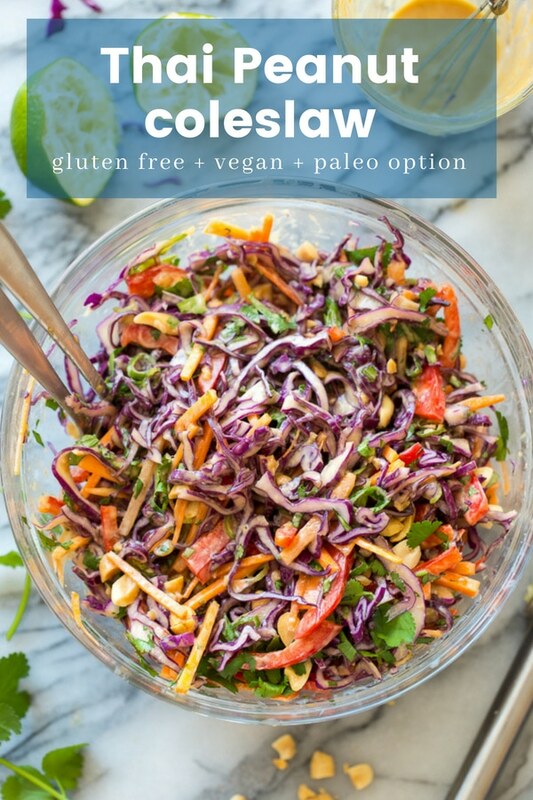 If you like this peanut coleslaw you’ll also probably enjoy our: Chopped Thai Broccoli Salad, Raw Zoodle Peanut Salad, Coconut Lime Chickpea Soup, Yellow Cauliflower Chickpea Curry, Paleo Thai Meatballs. 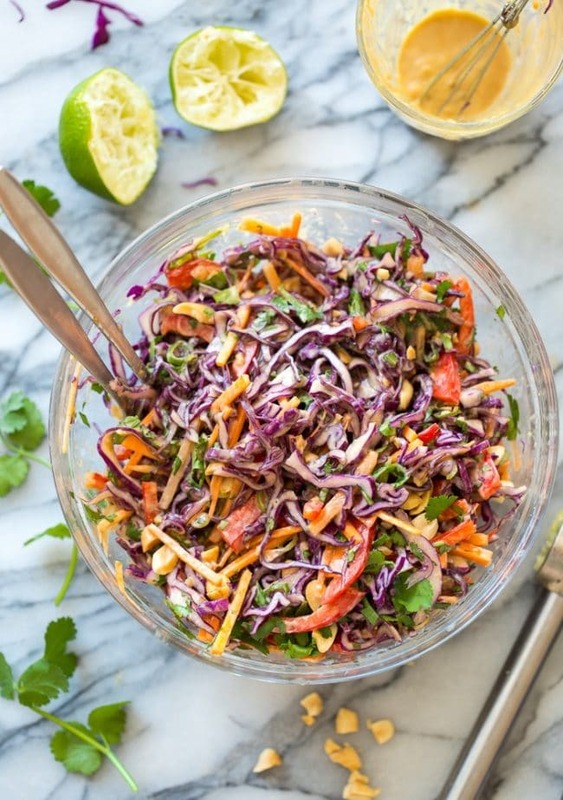 Don’t forget to #asaucykitchen on instagram if you try these Thai Peanut Coleslaw! I love seeing what you make! You can also post your pictures to my facebook page! In a small cup or jar whisk together all of the ingredients for the dressing until a smooth, creamy dressing forms. Taste and adjust seasoning as needed. Set aside while you prep the salad. 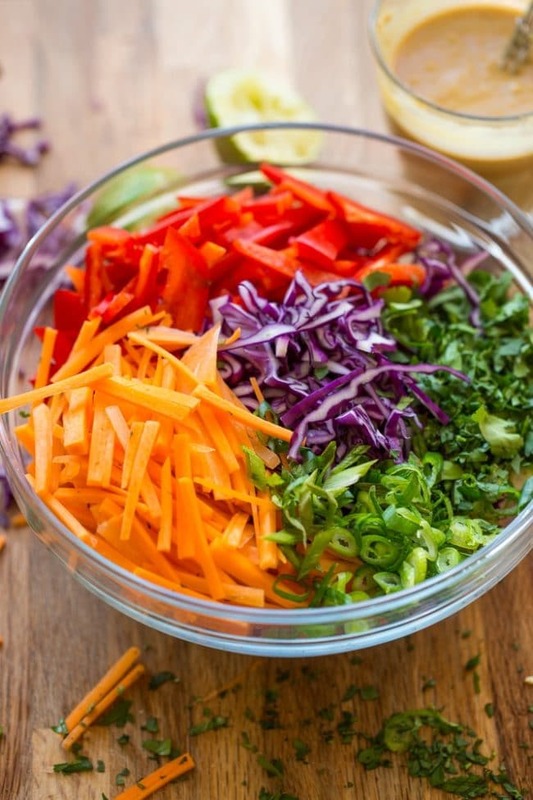 Add the cabbage, carrots, bell pepper, spring onions cilantro and peanuts to a large mixing bowl. Toss well to combine. 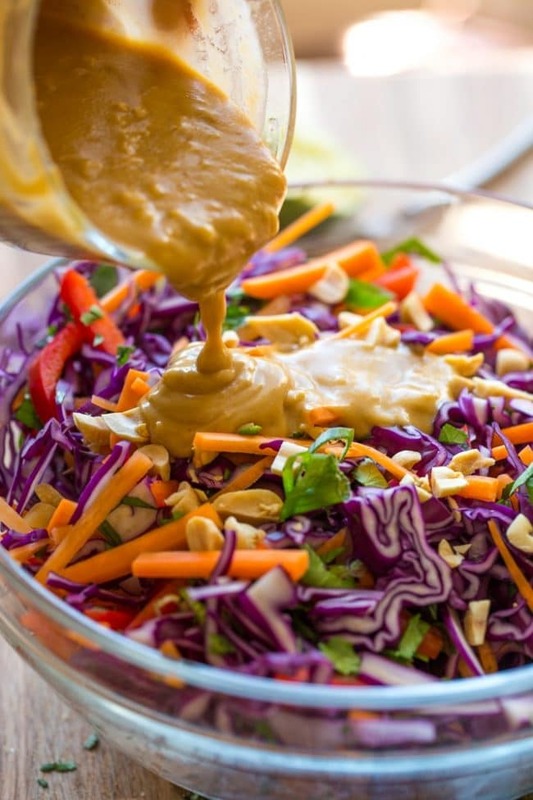 Pour the dressing over the salad and toss again to coat everything in the peanut sauce. If you plan on using soy sauce/tamaria start with 1 tablespoon. After you make your sauce taste and add another 1-2 teaspoons if you need to. Soy/Tamaria are much saltier than coconut aminos. If you plan on making this coleslaw a day in advance, prep and store the cabbage separate from the rest of the ingredients, undressed until you're ready to assemble to full salad. Cabbage has a high water content and can become soggy when left out. Wait to add the dressing until just before serving. Yummy. I found the dressing to be too thick so I added more lime juice, tamari, and oil. I also added fresh diced ginger. It was great!